Many parents hear Tummy Time is important and know doing Tummy Time helps baby build muscles and skills to meet their future motor milestones. But how do you know baby is making progress during Tummy Time? Use these abilities to ensure baby is continuing to develop though Tummy Time. Don’t forget: baby should be continuing to spend longer amounts of time on their tummy and eventually, they may even prefer their tummy to their back. Tummy to Tummy, Tummy Down Carry, and Lap Soothe are all positions that can be used in addition to Tummy Time on the floor. These positions help baby get used to Tummy Time but baby should be working towards Tummy Time on the floor. Tip at 2 Weeks: Many parents like Tummy to Tummy for their newborn. This allows you to be face to face with baby and enjoy lots of baby cuddles! Tip at 1 Month: To make it easier for baby to lift their head, place a rolled up towel or receiving blanket under baby’s chest and armpits. Tip at 2 Months: Face baby different directions in their crib each night to help develop neck muscles by turning a different direction to look at you each morning. Tip at 3 Months: Place baby tummy down on an exercise ball holding their sides for support. Slowly move the ball towards and away from you allowing baby to lift and hold their head easier. Lifts head up 90 degrees. Should be able to keep their head centered. Tip at 4 Months: Babies love faces! Even their own! Use mirrors during Tummy Time to help keep them engaged and having fun. Tip at 5 Months: Do baby push-ups. Place hands under baby’s chest and tummy. Use gentle lifting cues to get baby to push up on hands for brief periods. Baby should begin to prefer being on their stomach. Being on their tummy allows them to play, move, and explore more easily. 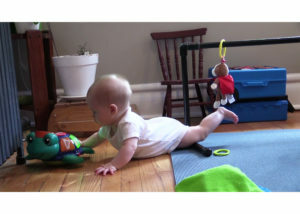 Tip at 6 Months: Encourage baby to practice rolling and moving while on their tummy. Use to​​​ys to keep them motivated! Make sure all caregivers know Tummy Time is a normal part of baby’s daily routine. Do a couple minutes of Tummy Time after every diaper change or after every bath so baby starts to expect it. Try doing Tummy Time when baby is most happy. Avoid Tummy Time immediately after feeding. Use time on the floor to play as an alternative to baby being in a carrier or bouncy seat. Make Tummy Time fun time! Sing songs during Tummy Time to calm and soothe baby. Use rattles, toys, and mirrors to encourage visual tracking. Get down on the floor at baby’s eye level. Baby loves your face! Don’t get discouraged. Every bit of Tummy Time makes a difference. 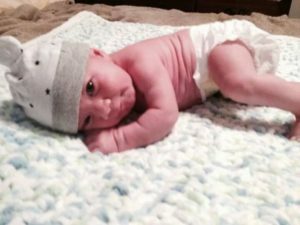 How Does Tummy Time Help With Meeting Milestones? Strengthens baby’s back, neck, and core muscles and helps build a foundation needed for baby to meet motor milestones including rolling, sitting, crawling, and more. Feeling different textures (blankets, carpet, etc.) on their arms, hands, and cheeks can help baby’s tactile sense (sense of touch). As baby moves and their weight shifts they gain a sense of body awareness. Helps develop eye and hand coordination. By looking down at their hands, baby is seeing how they move and what they can do. See a full list of developmental milestones baby should be reaching.